The moon has long been known to have an affect on not only our planet (the ocean responds to the moon twice a day) but also on us as well, especially women. We’re mostly made of water so it’s no surprise that we are also affected by the gravitational pull of the moon. Before technology and artificial lighting, the new moon was the time when women would have their monthly bleed. They would focus their energy inwards as it was a time of reflection and rest. It was also the time when women were considered most in touch with their intuition and the spirit realm. Today, in our fast paced world that caters to the energy of men, women are expected to keep the same tempo all month long. But our bodies don’t; they still follow a cycle just like the moon does. Did you know that every woman’s cycle follows a pattern with the moon? Even if you’re “irregular”. I found that I will bleed on the full moon, skip the next one, and bleed next on the following new moon. There are also ways to get back in sync with the moon but I haven’t looked into it. I just think it’s amazing the way we women are connected with the moon. When the sky is dark and the moon cannot be seen, this is a natural time to rest, reflect, and plan. It is not a time of action. 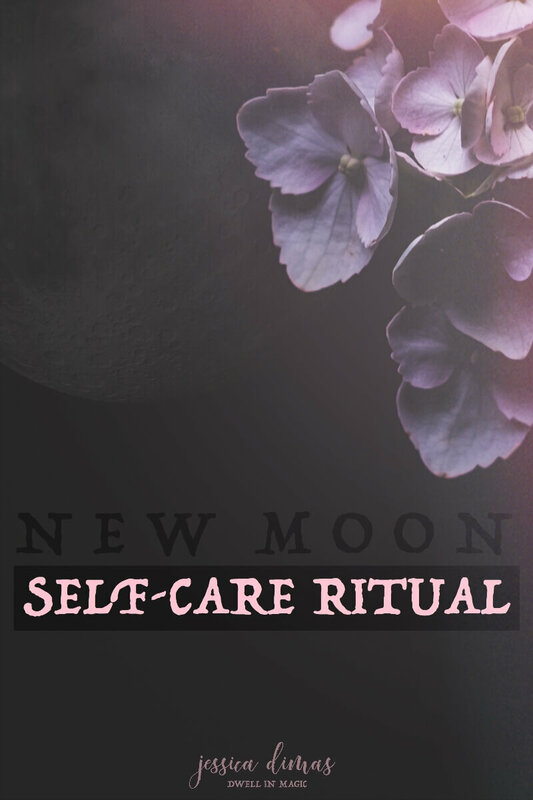 I LOVE doing self-care and mindset work with the moon cycle, because it touches on all aspects of self-care and manifestation. Rest, reflection, planning, following your intuition, inspired action, celebrating, releasing, and returning to a state of rest once again. The moon is our constant reminder to stay in touch with ourselves. To remember to step out of this busy world and reflect as well as listen to our true gut feelings. Constant action is not productive or healthy. As women, one of our unique powers lies within connecting with our intuition, putting feeling into our intentions, and then taking inspired, joyful action towards it. Women are magical in my opinion. And the moon is your reminder of that. You’re connected to the moon, and I invite you to flow with her feminine energy to keep your own body and soul in balance. Here is my favorite New Moon self-care ritual. To begin, I always like to make sure my sacred space/altar is clean and inviting. 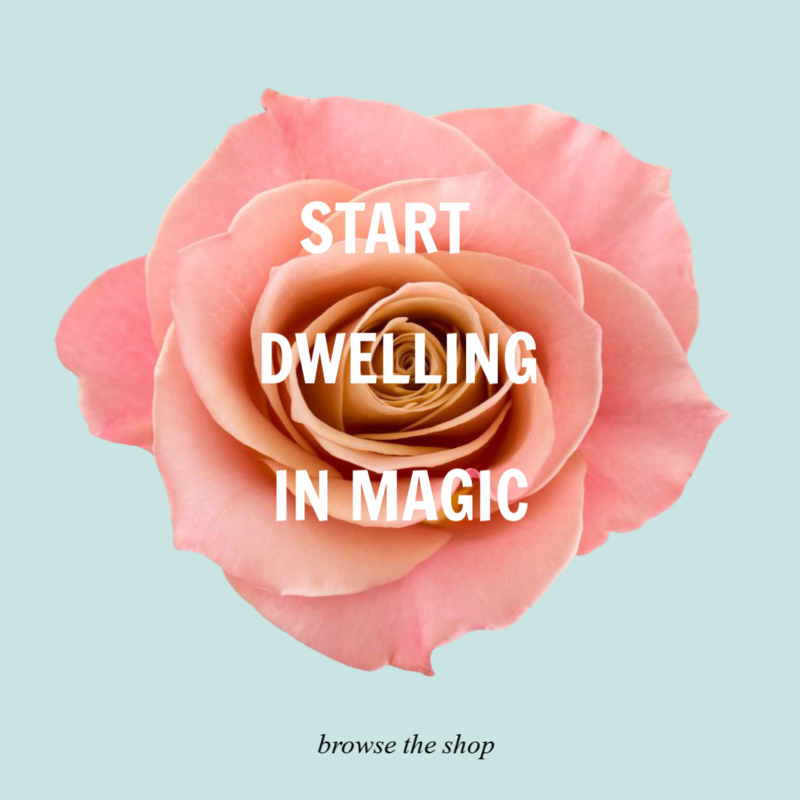 I dust it, clear it off, throw away anything in the drawers (my space is my nightstand, check out my post here for how to create a sacred self-care space). I gather anything I’ll be using; candles you may want to use (white is great color for new beginnings), incense, crystals, journal, pens, paper, etc. Have it all set up and ready. On a side note, one of my favorite ways to collect sacred self-care items is through this subscription box. Once a month I get a new crystal, plus things like quality incense and essential oil sprays and roll ons and they usually follow a theme according to the season, which I really like. Water symbolically washes away the old. I love to run a bath and fill it with detoxifying bath salts (you can make your own or you can buy them). They don’t even have to be specifically for the new moon. Plain epsom or Himalayan salts are just fine in my opinion. They pull the impurities from your body but what is most important for me is the symbolic action of washing away the last month and any let downs or regrets I had. I like to dim the lights, pour about 2 cups of epsom salt into my bath and then relax there for at least 20 minutes. I love playing beautiful music (I’m currently obsessed with Peter Gundry’s music; it’s mystical and calming, my favorite song of his is Cerdiwen) to just really help myself step from this world into the quiet world of the dark moon. Envision the water taking away anything negative you’ve been holding onto. Submerge yourself and be still. Clean your slate for the new month. Next I go to my sacred self-care space and ground myself. An easy way to ground yourself is by having all four of nature’s elements present in your space. Crystals represent earth, a candle represents fire, incense represents wind, and a bowl of water with salt in it can represent the ocean. Having these elements around me is instantly calming and brings about a very spiritual feel. Have crystals out that you’re drawn to (moonstone is an excellent crystal for new beginnings, as is labradorite and amazonite), and light a candle and some incense if you’d like. Close your eyes and just start with taking some deep, recentering breaths. Let your breath go all the way down into your womb area. Feel the ground beneath your feet, and know that you’re connected to mother earth. Visualize a safe, white light around yourself or your space if you’d like. Once I’ve done this, I will energetically clear myself and my space. I love palo santo sticks to clear the energy surrounding myself and my items. You can also use sage if you prefer. I just love the woodsy, earthy scent of palo santo. So I will light a palo santo stick and wave the stick around myself in circular motions and then around my space and any items I want to energetically clear, like my oracle cards. And for anyone out there who doesn’t really understand why I would do this, it’s because everything is made of energy…science is proving that now. Negative energy can become stuck or linger. Sage and palo santo actually changes the ionic composition of the air, so you’re literally clearing the air. The smoke also has an affect on our bodies, sending more oxygen to our brains and stimulating a relaxation response. I think it’s amazing that our ancestors did this before they had any science to explain why and how it works. They just intuitively knew. Once you feel grounded and connected, a great way to continue the cleanse and create a fresh slate is to journal. Release what’s been on your mind. Don’t worry about what you’re writing, just write and let it flow out of you. You’re clearing your heart and mind so that you have a truly fresh start for the next four weeks. Write about what you’d love to experience next. What sort of intentions do you feel pulled to set? I use the moon worksheets which have guided prompts and journaling space. Another thing I love to do, especially during the new moon, is to pull oracle cards for spiritual guidance. There are many New Moon spreads you can look up on Pinterest. My favorite oracle decks are Sacred Rebels and Goddess Guidance. Whether you believe in a higher power, spirit guides, angels, or simply your subconscious mind, oracle cards are way to receive divine guidance. You ask for guidance, general or specific, and allow your intuition to shuffle the cards until you feel done, and then pull a card/cards that you’re drawn to. What energy is abundant for me during this New Moon cycle? Once you’ve cleared your mind and thought about what you want to create/manifest, write down your intentions. You can do this for the next 4 week lunar cycle or for longer. Be very specific writing down your intentions of what you want to manifest. The clearer you are, the easier it is for the Universe/your subconscious mind to begin creating it. The easier you can conjure up how you want to feel around this intention, the better you’ll be able to energetically attract it to you. After you write your intentions down, lay down on your bed and close your eyes. Listen to music if it helps you concentrate. Visualize in your mind your intentions manifested. Let yourself go and really allow your imagination to see this picture crystal clear. It should be so clear that you actually begin feeling the emotions of your intentions already completed. For example, this coming new moon I’m going to set an intention for my husband to have a successful season at work (he wants this as well so we are co-creating it together). I want to experience him coming home excited and not stressed. I’m going to visualize him and I giddy over the phone talking about exciting news, about us going out to dinner to celebrate, of us practically jumping up and down because everything is going so well. Fold your paper with your intentions up and place it somewhere hidden. Take it out and read over it every night, visualizing your intentions and feeling them completed. When it’s time for a full moon self-care ritual, you can light this paper on fire and burn it, releasing your intentions and trusting the Universe to deliver. The main point of a new moon ritual is rest, reflection, planning, and getting in touch with yourself. Know that our whole universe is made up of energy and that you have the power to create beautiful things in your life. You’re more magical than you’ve been led to believe, and you have unseen forces waiting at your beck and call. If you’d like this new moon ritual on paper, I have it all laid out in Manifesting Magic with the Moon which is a collection of moon worksheets to help guide you through the lunar cycle every month. Jessica Dimas is the creator of Manifesting Magic with the Moon. Connect with her on Facebook and Instagram for more inspiration and updates. I am SO excited to try this! Amazing tips! Thank you so much for this post and many others – I’m a first time commenter, but I’ve been following your blog for a while now. I am always so appreciative of your advice. You’ve really helped me on my own spiritual journey! Sending love to you Jessica! Excellent, excellent post! Perfect timing and a much needed read for me. Thank you Jessica! I’m slowly getting back into magic and rituals, after years of being out of touch with that part of me, so I may not follow everything from this ritual but I’ll take it as awseome inspiration, so thank you very much for sharing it!! I am new to your blog but I love your posts! I did have a question about when to perform these rituals? If I missed I do apologize… but any help would be much appreciated!! Hi Amber! You can perform them anytime within a 3 day window. So a day before the New Moon, the day of and the day after. Of course closest to the time of the New Moon is when the energy is at it’s peak but really I do mine anytime within that window.